The oldest hotel at Disneyland, the Disneyland Hotel, offers guests an impressive combination of modern amenities mixed with classic Disney history. The hotel has a little something for everyone, from adventure seekers looking for the best water slide to Disney geeks wanting to walk in Walt’s footsteps. TravelingMom has the very best tips to make the most of any kind of stay at the Disneyland Hotel. The year 2015 has been a milestone for Disneyland. While the resort continues to celebrate its 60th Diamond Anniversary, a smaller anniversary of sorts was recently marked just down the street at the Disneyland Hotel. The Disneyland Hotel was the very first hotel to open to serve the resort, just three months after the park’s opening day. Sixty years later, the hotel looks quite a bit different, but the Disney magic lives on. My family recently had the chance to stay at the Disneyland Hotel with both of our children (ages 2 and 6). We stayed at the hotel on a previous Disneyland trip and have also visited to dine several times. I must confess that it is by far my favorite hotel at Disneyland. What makes it stand out? The amazing amenities (monorail themed pool!) and magical Disney touches (musical illuminated headboards!) certainly loom large, but the sense of history that still lingers over the place is perhaps the most compelling. The hotel embraces and celebrates nostalgia. Even though it was not owned by Disney for the first three decades of its existence, the history of the Disneyland Hotel is inextricably intertwined with the history of Disneyland itself. Walt had a close partnership with its founder, Jack Wrather. Like Disneyland, it has grown, evolved, and changed with the times while preserving a historical legacy. Long walk back to hotel through crowded Downtown Disney if and when monorail is not available. Popularity means that early check-in and late check-out are very hard to come by. Expensive prices, particularly in comparison to similarly close non-Disney hotels (rack rate for standard view rooms is $375 a night as of fall 2015, although discounts are often offered especially in low season). The Disneyland Hotel is located on far end of Downtown Disney, about a 12-15 minute walk from the front gates of Disneyland park and California Adventure. It is also served by the Disneyland monorail, with a station just a 3 minute walk away that drops guests directly into Tomorrowland. One of the benefits of staying at a Disney owned hotel like the Disneyland Hotel is Extra Magic Hour, which allows access to one of the two parks one hour early each morning. The Disneyland Hotel’s 975 rooms are located in three separate towers. These towers encircle a large center courtyard where several pools dot the landscape. Each of the three towers celebrates a theme important in Disney history: Fantasy Tower, Adventure Tower, and Frontier Tower. Disney fans will especially enjoy the art and memorabilia reflecting Disney history in the lobby of each tower and throughout the hotel. TMOM Tip: If possible, request a room in either the Adventure or the Fantasy tower. Although we’ve stayed happily in the Frontier tower, it is a bit of an extra walk when coming from the parks or monorail. After a day walking in Disney, every step counts. TMOM Tip: If you are a Disney history buff, make time to take one of the daily one hour complimentary hotel tours. Times are published in a brochure available at check-in. I took a tour detailing the 60 year history of the hotel and learned some fascinating Disney trivia. 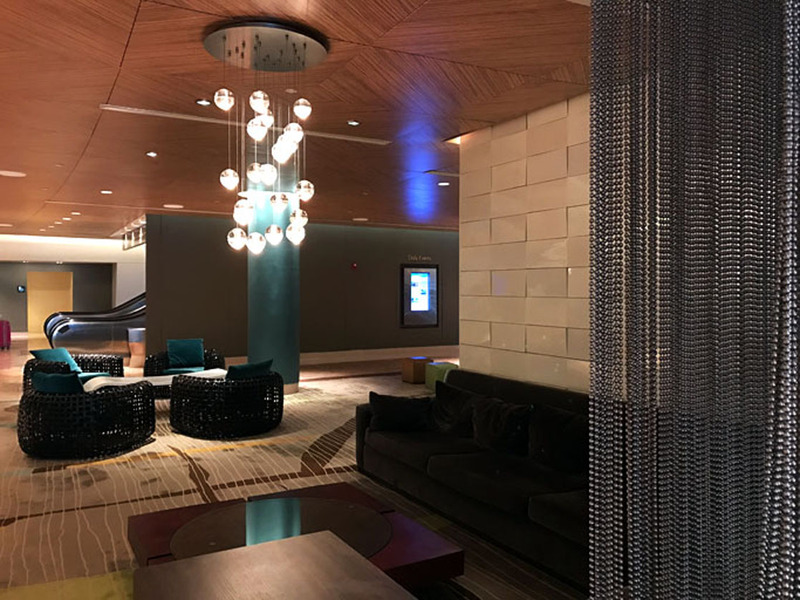 The hotel also includes a convention center, multiple pools, fitness area, gift shop, convenience store, third-party operated business center, and several restaurants. The pools at the Disneyland Hotel are truly a standout and are a major reason to choose the hotel over other options in the area. The focal point of the pools are large replicas of the Mark 1 Monorails which serve as the pool water slides. Our 6 year old daughter found the right level of thrills on the largest of the three slides, while our 2 year old son was finally convinced to try the smallest slide and fell in love. The D-Ticket and E-Ticket pool (another nod to Disney history) are also large and well-themed. TMOM Tip: The pools are closed seasonally, so consider your hotel options carefully in winter months. The upside, of course, is that some of the biggest discounts may be available when pools are likely to be closed during the slow season in January and February. The hotel offers usual poolside fare like burgers, with servers who bring food directly to your pool chair. No need to get up and stand in line to place an order. Another little detail at the pool that will matter to families of younger children is that the hotel offers free life vests to borrow. The Disneyland Hotel was one of the very first to cater to families and that tradition continues today. Room layouts, sizes, and amenities are obviously made with families in mind. With a toddler, I especially appreciated the Pack N Play and refrigerator in every room. My 6 year old daughter’s favorite feature was the headboard over the bed, which lights up to reveal fireworks over Sleeping Beauty Castle. It plays the Disney classic song “A Dream is a Wish Your Heart Makes.” No night light will ever compare. Thanks to a bit of a room mix-up, we had the chance to view both a king room in the Adventure Tower as well as a two queen room in the Fantasy Tower. The king rooms are quite a bit smaller, so I’d recommend that families (even those with just one child who will occupy the Pack N Play) request two queen rooms just for the extra space. The two queen rooms are also a bit bigger than their equivalents in the Grand Californian in case you find yourself comparing other Disney-owned options. One thing I always look for in a hotel is a bathroom that can be fully closed from the rest of the room. Otherwise, my husband and I risk disturbing our children as we get ready in the morning before they wake up. At the Disneyland Hotel, we were happy to see that the bathrooms can be closed off entirely by a regular door. The two queen rooms have a further second door dividing the toilet from sink and tub (in the king rooms, the bathrooms are a single room). Another major advantage of staying at the Disneyland Hotel is having easy access to several unique restaurants. On-site character dining for breakfast and dinner is available at Goofy’s Kitchen, which has been one of my family’s favorite Disney character meals for many years. The meal features creative food your children will love (try the macaroni and cheese pizza). My family also appreciated the eclectic mix of classic and more obscure characters available to meet-and-greet. We saw everyone from Pluto to Alice in Wonderland to Gideon from Pinocchio. In addition, all guests are guaranteed to meet Goofy. TMOM Tip: Since morning can often be the best time to get a jump on the crowds in the parks, consider booking dinner instead of breakfast at Goofy’s Kitchen to make the most of your park time. Character dining is increasingly popular at Disneyland, so reserve early! Fans of Hawaiian food and culture should head to Tangaroa Terrace for a casual bite to eat near the pool. But the crown jewel of the Disneyland Hotel is definitely Trader Sam’s Enchanted Tiki Bar next door. The mai tais are expensive but worth every penny, especially since most drink prices include souvenir mugs to take home. Parents need not miss out on the island spirits even if they don’t have a babysitter, as kids are welcome at Trader Sam’s until 8 pm. TMOM Tip: The wait for seats inside Trader Sam’s can be substantial due to the bar’s popularity, so families with little ones who can’t wait should snag a seat on the outdoor terrace. The same drinks and small bites are available there. The Disneyland Hotel’s other restaurant, Steakhouse 55, offers a more elegant and intimate dining experience with dark wood walls and tablecloth service. I dined there for breakfast during my visit and it was noticeably quieter. Steakhouse 55 is the place to eat for couples and families with older children who want to escape the crowds. For families looking for a fully-themed and immersive Disney hotel experience, the Disneyland Hotel should probably be your top pick. But even if an overnight stay isn’t in the budget, the Disneyland Hotel is worth a stop on your Disneyland vacation. It offers several unique dining experiences that can’t be replicated elsewhere and reminds every Disney fan of a long and magical historical legacy. Have you stayed at the Disneyland Hotel? What were your favorite features? Do you have tips to share?